This route starts at the end of the Gunflint Trail and is perfect for those wanting to do it all. It has waterfalls, large and small lakes, solitude, historic sites, cliffs, and excellent fishing. 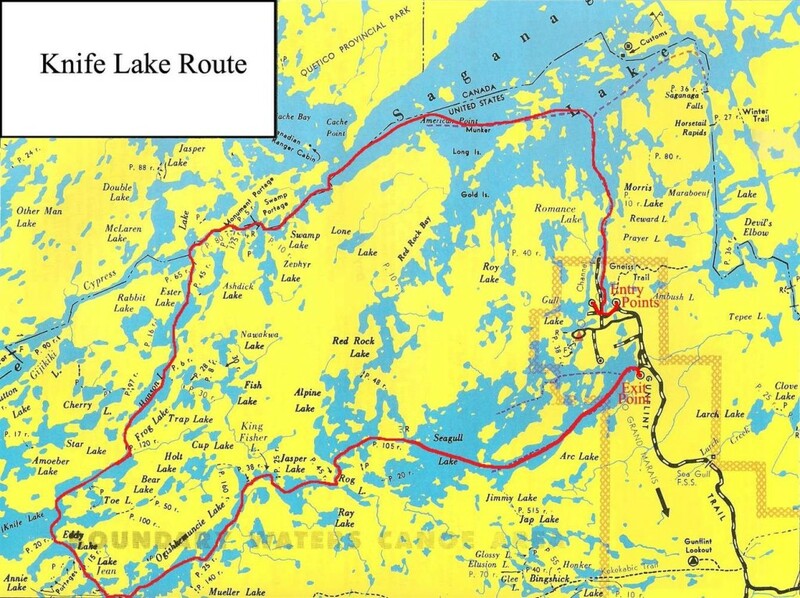 You must be willing to paddle; Knife Lake, the farthest point on this route, is about halfway between Ely and the Gunflint Trail. This is one of those areas that is so remote most visitors won’t see it. If you have extra time to spend on Knife Lake you can paddle to Dorothy Moulter’s island or hike to Thunder Point. Saganaga is a very large lake and needs to be respected on windy days. Ottertrack Lake is spectacular and you will see an historic monument portage. You can swim in Eddy Falls and a side trip to Mueller Lake will reward you with a second waterfall. Fishing is excellent with Walleye, Northern Pike, Lake Trout and Smallmouth Bass. Base campers usually like to get to Ogishkemuncie. If you have extra time, there are hundreds of expansion options and some extremely good campsites. If you are interested in crossing Saganaga Lake via motor boat we can arrange for a tow to American Point.